Docosahexaenoic acid, or DHA, is a polyunsaturated Omega-3 fatty acid. It is a major structural fat found throughout the body and is most abundant in the brain, eyes and heart. DHA’s benefits have been shown through a number of studies to boost brain function, relieve swelling, support eye health and enhance memory and vascular functions. Omega-3 fatty acids are made up primarily of 2 components, DHA and EPA. Ongoing research is finding that the DHA component may provide the greater benefit of the two. 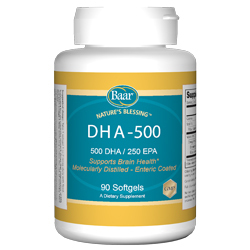 DHA may be one of your heart’s and brain’s best friends. Tissues that need the largest amount of CoEnzyme Q10 are those that require the most energy, such as the heart. In more than one clinical setting, below-normal levels of CoEnzyme Q10 have been noted in cardiac patients. University studies have shown that some overweight people also have a tendency for low levels of CoQ10. As individuals require more energy, more CoEnzyme Q10 is needed. 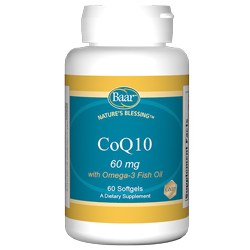 Baar’s Nature’s Blessing CoQ10 supplement is also combined with heart-healthy Omega-3 fatty acids for added protection. 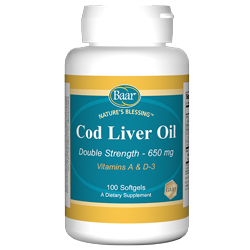 Baar’s Cod Liver Oil Softgels contain twice the Vitamin A and natural cholecalciferol D3 than regular strength Cod Liver Oil softgels. The combination of Vitamin A and D3 may help to reduce the risk of heart disease, reduce joint and arthritis pain and/or aid in slowing the destruction of joint cartilage. It also contains Omega-3 fatty acids, specifically EPA (Eicosapentaenoic Acid) and DHA (Docosahexaenoic Acid), which have been shown to support overall health. Our Cod Liver Oil is screened for impurities and is free of additives and preservatives. Nature’s Blessing™ Blood Pressure Advantage contains powerful antioxidant polyphenols from Grape Seed Extract (GSE). Grape Seed Extract helps protect our blood vessels from damage which allows the body to maintain blood pressure levels that are already within the healthy range. Polyphenols are naturally occurring in fruits, vegetables and red wine and are known for supporting cardiovascular health. Grape Seed Extract is one of the largest sources of polyphenols. Blood Pressure Advantage also contains a heart-healthy flavonoid Hawthorn Extract, which works as a synergist. This means that the Hawthorn Extract may enhance the antioxidant effects of MegaNatural®-BP™ (the GSE in Blood Pressure Advantage). Along with a healthy diet and supplementation, it is important to stay fit and active. Start your heart-healthy program today. This entry was posted in Cardiovascular on September 29, 2015 by Dr. Bruce Baar. Why do I need Vitamin D-3? Doctors found many years ago that children exposed to sunlight or those who took a Cod Liver Oil supplement were less likely to suffer from a bone condition called Rickets. Sunlight allows the body to produce Vitamin D-3, and Cod Liver Oil supplements naturally contain Vitamin D-3. Since then, years of research has shown that Vitamin D-3 benefits the body in more ways than one. Vitamin D-3 is crucial for the metabolism of Calcium and Phosphorous, for the support of healthy bones and teeth, for providing added protection for immune challenges, for reinforcing healthy brain function, enhancing mood and cognitive function and much more. Where does Vitamin D-3 come from? 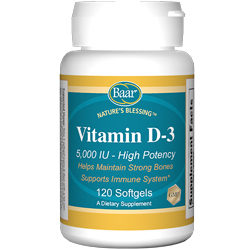 Many know Vitamin D-3 as the “Sunshine Vitamin”. The body produces it during exposure to the sun’s ultraviolet rays. When sunlight hits the skin it synthesizes to form D-3, which then circulates into the blood stream. Certain foods contain limited amounts of it. However, it may be difficult to get enough to supplement the body’s requirements from these sources alone. Different skin tones absorb different amounts of vitamin D-3. Lighter, fair skinned people will need less sun exposure to absorb a sufficient amount whereas darker skinned people may require as much as double the amount of sun exposure. This can present a problem during the colder months of the year as well as during the work week when sun exposure is often limited. Because absorption of it differs among individuals, regular testing will reveal your body’s needs. It may be helpful to ask your health care practitioner to test for its levels: once at the end of winter and again at the end of summer. This determines how much your body manufactures through summer sun exposure, and quantifies the need of it during the winter months to maintain healthy levels. As more people avoid sun exposure and because it is not abundant in food, supplementation becomes essential to ensure that your body receives an adequate supply. Nature’s Blessing’s New High Potency Vitamin D-3 supplies this key nutrient in a higher potency, absorbable liquid softgel. Take 1 softgel every two days to supply the body with 5,000 IU. Optimizing your levels can give your immune system a boost, improve muscle function, and support bone, brain and cardiovascular health. Experience the many benefits and keep your system running strong. This entry was posted in Anxiety, Stress, and Sleep, Bone, Joint, and Muscle Health, Cardiovascular, Immune System, New Products on April 13, 2015 by Dr. Bruce Baar. This combination of Sarsaparilla root, Wild Cherry bark, Burdock root, Buchu leaves, Mandrake root, Tolu Balsam and Grain Alcohol works to support healthy eliminations and system detoxification. Just a teaspoonful of De-Tense herbal tonic after each meal and just before retiring works to restore balance to the entire body. This entry was posted in Cardiovascular, Digestive Health on October 13, 2014 by Dr. Bruce Baar. How does Grape Seed Extract in Blood Pressure Advantage Help? Our cells can be damaged from a number of environmental factors such as air pollution, smoking, ultraviolet light and more, which turn into free radicals (also known as oxidants). Antioxidants are substances which may prevent or delay the oxidation of bad molecules in the body. As we age, these free radicals occur naturally in the body and continue to grow in number which can lead to chronic illness or diseases. Antioxidants continue to be the first line of defense in the body, protecting it against these damaging factors. Nature’s Blessing™ Blood Pressure Advantage contains powerful antioxidant polyphenols from Grape Seed Extract. Grape Seed Extract (GSE) helps protect our blood vessels from damage which allows the body to maintain blood pressure levels that are already within the healthy range. Polyphenols are naturally occurring in fruits, vegetables and red wine and are known for supporting cardiovascular health. Grape Seed Extract is one of the largest sources of polyphenols. Blood Pressure Advantage also contains a heart-healthy flavonoid Hawthorn Extract, which works as a synergist. This means that the Hawthorn Extract may enhance the antioxidant effects of MegaNatural®-BP™ (the GSE in Blood Pressure Advantage). What are MegaNatural-BP and Hawthorn Extract? Meganatural®-BP™ is a trademark of Constellation Wines US, Inc. A division of Constellation Wines US, Polyphenolics, has an ample supply of quality grown wine grapes and produces a line of clinically proven products with a patented solvent-free extraction process. The Grape Seed Extract in MegaNatural®-BP™ is made from a special blend of unfermented red and varietal white wine grape seeds. Hawthorn is a tree or large shrub in the Rosaceae family. Blood Pressure Advantage uses the leaves and flowers of the Hawthorn Plant because it is known to have many benefits to the cardiovascular system. The Hawthorn Extract also contains 1.8% Vitexin which may help support blood pressure within the healthy range. Supplementing with Blood Pressure Advantage, maintaining a healthy diet and exercising regularly are all factors which will aid in keeping your blood pressure within the healthy range. This entry was posted in Cardiovascular on August 19, 2014 by Dr. Bruce Baar.